Han Solo may not have been one of the most outstanding recruits the Empire ever had--let's face it, following orders is not his thing--but he did get to wear one of their most distinctive outfits in Solo: A Star Wars Story: that of the Mimban Mudtrooper. Designed for heavy swamp duty, the outfit features standard Imperial upper armor for combat, unarmored-but-thick pants to keep you warm but mobile through waist-deep muck, rain poncho, and goggles and helmet that echo the sartorial style Han's future son will one day make his own. Unlike some collector figures that use alternate heads, this one has a helmet and mask that are fully removable. If you think you notice a slight anime influence, well...us too. Preorders are $235, with the figure expected to ship next summer. And Sideshow (Hot Toys' U.S. distributor) offers installment plans, so you can stretch it out over four parsecs payments. 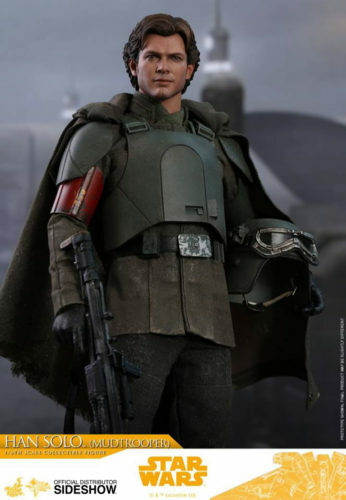 Hot Toys are actually the first licensor to roll out a Han Mudtrooper figure, but we can certainly hope Hasbro will follow suit. This is, after all, the outfit in which he met Chewbacca. Give us a mud-Chewie and support beam accessory, and you have the movie's most insta-iconic moment. 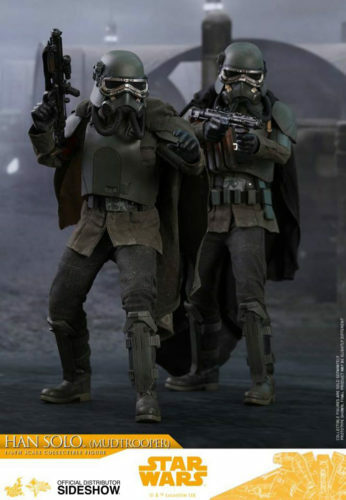 Looks like a damn dirty Mimban Stormtrooper is also on the way! It's an easy enough repaint with an added cape, so why not? Are you the sort of collector who likes to get your Hans dirty? So lo and behold, this might become your next acquisition? Kessel run down to comments below and let us know what other dad puns you can make of this news.